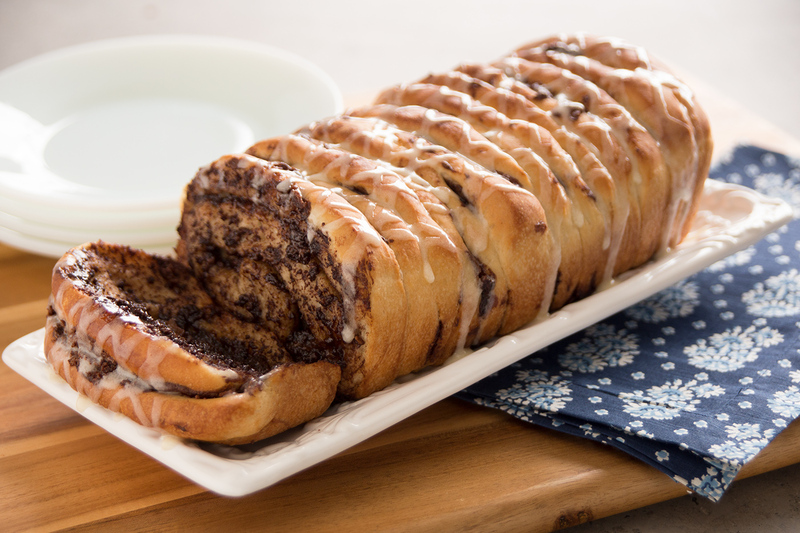 Cinnamon Rolls and chocolate spread combine to make this a delicious loaf fit for any occasion. Slice each cinnamon roll in half through the side to make 16 thin cinnamon rolls. Spread chocolate spread on each roll except for the last one. Stack them together in stacks of 5 or 6 so they don’t fall over. Tip each stack on it’s side and place stacks in a sprayed loaf pan. There should be no chocolate spread on each end. Cover with sprayed plastic wrap and let rise until loaf reaches the top of pan. Remove wrap and bake at 350 degrees F 25-30 minutes. Cover with foil to prevent over browning last 5-10 minutes of baking, if necessary. Drizzle with frosting.